After a summer of eating greens that have become tough and bitter, I look forward to tender hothouse lettuce. This refreshing Butterhead, Apple, Beet and Almond Salad with Herb Buttermilk Dressing combines soft butterhead lettuce with contrasting textures and flavors. Thinly sliced apples give it tartness and crunch. Sliced cooked beets add a soft sweetness and bright color. 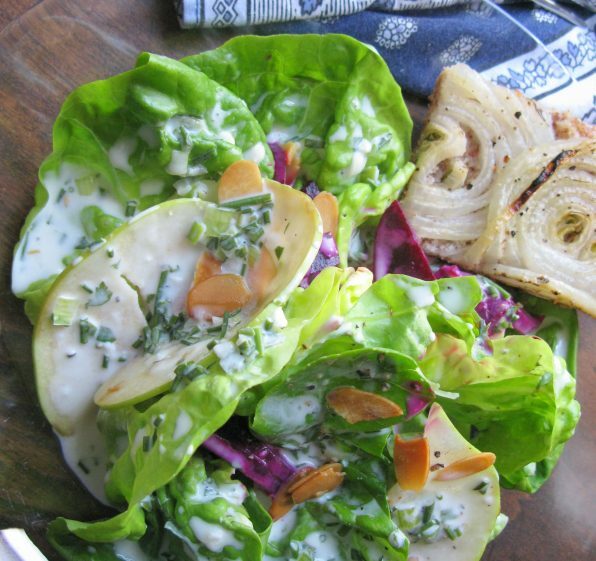 The herb buttermilk dressing ties the salad together. Because salad is all about texture, I finish it with toasted sliced blanched almonds for crunch. They shatter like glass when you bit into them. To compose the salad, use a light hand with the dressing. Even though it is thin, it will weigh down the delicate leaves. And it packs a wallop of flavor especially as it sits. (The mustard flavor permeates and has the same effect on the palate as mild horseradish.) I dress a small amount of the greens at a time then tuck in the apple and beet slices. This keeps the salad fresh looking. You might hesitate to buy a quart of buttermilk but don’t. Use any leftover buttermilk in place of yogurt, in muffin and pancake batters or in another batch of this dressing. Buttermilk keeps for up to two weeks in the refrigerator. I always looks for Kate’s Homemade Butter, Fresh Buttermilk. It has a pleasant tang and irregular texture, which tells me that it is full of living cultures. To make the Buttermilk Dressing: Whisk the mayonnaise into the buttermilk in a small bowl. Stir in the remaining ingredients. Add more salt and pepper to taste. To make the Butterhead, Apple, Beet and Almond Salad: Separate the leaves from the head of lettuce. Remove the bottoms of any hard ribs. Wash and dry them thoroughly in a salad spinner or in a clean towel. Cut the apple into paper-thin slices using a mandolin or a sharp knife. Don’t worry about the small amount of core; we need the fiber. Place half of the lettuce in a salad bowl. Add ⅓ to ½ cup of the dressing and gently toss just until each leaf is coated. Divide the coated lettuce leaves between two or three plates. Then do the same with the remaining lettuce. Tuck the beets and apple slices into the folds of the coated salad leaves. Drizzle the salad with more dressing if needed. Scatter the almonds over the salads. Season generously with black pepper.